Hearing over MF Global collapse may not have offered lawmakers much satisfaction. WASHINGTON (AP) — Jon Corzine's three days of testimony on MF Global's collapse offered little to satisfy lawmakers or farm clients who lost millions when the securities firm failed. Yet legal experts say Corzine helped himself by choosing words with care and articulating an explanation that's hard to disprove. Corzine, a Democratic former senator and governor of New Jersey, told three congressional panels that he never intended to "misuse" client money or order anyone else to do so. He said no reasonable person who worked with him could have concluded otherwise. He also rebuffed an assertion that he knew about customer money that might have been transferred to a European affiliate just before MF Global collapsed. It could be hard to build a persuasive case that he did know, experts say. "It's remarkable how he really has narrowly walked that line — to be able to communicate effectively while preserving his defenses," said Jacob Frenkel, a former enforcement attorney with the Securities and Exchange Commission, one of the regulators investigating MF Global. "He could have hurt himself by testifying. That has not happened." About $1.2 billion was found to be missing from client accounts when MF Global failed on Oct. 31, becoming the eighth-largest bankruptcy in U.S. history. Much of the missing money belonged to farmers, ranchers and other business owners who used MF Global to reduce their risks from the fluctuating prices of commodities such as corn and wheat. Brokers such as MF Global generally are required to keep customer money in separate accounts to protect it in case the company fails. MF Global apparently failed to do so. Congress, regulators and criminal investigators are looking into the case. Those investigations, still in their early stages, will likely yield clearer answers about how client money came to be misused. For now, it remains a mystery. "I think it was unrealistic for Congress to expect substantive answers to these questions, because no one is that naive," Frenkel said. "That's why these investigations are ongoing — to figure out what happened to the money and who is responsible." Some of the lawmakers who questioned Corzine appeared to agree. "If you did anything wrong, the criminal investigators will find that; I won't," said Massachusetts Rep. Michael Capuano, the top Democrat on the panel Corzine faced Thursday. Corzine was careful to testify that he never "intended" for client money to be misused. That's because intent is a key requirement of criminal prosecution, Frenkel said. "If someone intended to violate (rules requiring the separation of client accounts), then the conduct is criminal," he said. "If it was unintentional, we are only in the zone of civil enforcement, if that." If Corzine or others at MF Global are found guilty of civil violations, they might have to pay financial penalties. One regulator raised the possibility Thursday that crimes were committed. As a primary dealer, MF Global made trades with the Federal Reserve Bank of New York. As the firm's finances worsened in its final weeks, the New York Fed required MF Global to put aside more money to cover the Fed's losses in case the firm failed. New York Fed General Counsel Thomas Baxter testified that MF Global gave "express representation in writing" that the money it put up was not from client accounts. "If that representation turns out to be false, a federal criminal offense has been committed," Baxter said. Michael Greenberger, a professor at the University of Maryland School of Law and a former regulator, said the hearings resolved none of the questions surrounding MF Global's failure. "Regulators' enforcement divisions and the Justice Department will work together because if the money is missing, somebody did something wrong," Greenberger said. And given the damage done by MF Global's failure, there's little Corzine can do to revive his public image, said Michael Robinson, a former SEC official who now works in crisis communications. "Unless Jon Corzine can look under the mattress in his house and find $1.2 billion to give back to customers, his reputation is beyond repair," Robinson said. He noted that Corzine spent a career branding himself as an effective manager. Corzine rose from the trading floor of Goldman Sachs to become the investment bank's co-chairman. He then ran successfully for the U.S. senate and one term as governor of New Jersey. Corzine joined MF Global shortly after losing his bid for a second term. Now, to protect himself legally, Corzine must avoid being precise about what occurred at the firm he led until last month. That's why many legal experts had expected Corzine to invoke his Fifth Amendment right against self-incrimination. He never did. Much of Corzine's testimony Thursday involved an allegation that he knew about customer money that may have been transferred to a European affiliate just before MF Global collapsed. 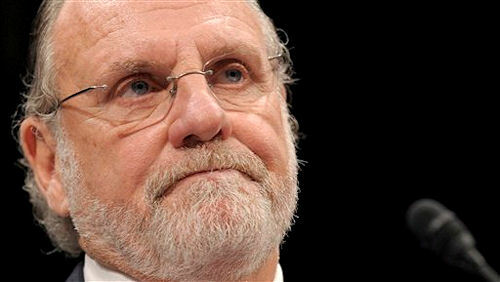 "I did not instruct anyone to lend customer funds to MF Global or any of its affiliates," Corzine told a House panel. He also said he didn't know about "the use of customer funds on any loan or transfer." It was his first public appearance since Terrence Duffy, CME Group Inc.'s executive chairman, alleged Tuesday that he might have known about the $175 million transfer. MF Global traded on exchanges managed by CME Group. According to Duffy, an MF Global employee told a CME auditor that "Mr. Corzine was aware" of the earlier transfer. Duffy said he referred the matter to the Justice Department and the Commodity Futures Trading Commission. The transaction Duffy described wasn't necessarily illegal. Brokers such as MF Global are allowed to borrow from customer accounts temporarily in some circumstances — to reduce their own risk, for example. But such cases are a narrow exception. A firm couldn't use customer money to pay trading partners if its speculative trades lost value. Even in cases where borrowing clients' money was legal, the firm would have to replace it with a safe, cash-like investment such as a U.S. Treasury security. Corzine also was questioned about whether he used his relationships with regulators to gain advantages for MF Global. Corzine has been a major fundraiser for Democrats. He was co-chairman of Goldman Sachs Group Inc. In that role, he worked with two other Goldman executives at the time: Gary Gensler, now chairman of the CFTC, and William Dudley, now president of the Federal Reserve Bank of New York. Gensler has recused himself from the investigation because of his long history with Corzine. Along with other Wall Street executives, Corzine lobbied Gensler and his staff last summer against a possible CFTC rule that would limited how their firms can invest clients' money. Afterward, the CFTC delayed adopting the rule until earlier this month. Early this year, the Federal Reserve allowed MF Global to join an elite group of 22 dealers that help the government sell Treasury securities. The Fed did not assess MF Global to see if it was taking on too much risk. Instead, Fed officials relied on oversight by the CFTC, the SEC and others. The role of primary dealer conferred on MF Global a seal of financial strength. It gave the firm a competitive edge and likely lowered the interest it was charged to borrow, experts said. Asked whether he received privileged treatment from the regulators because of his connections, Corzine said, "We didn't ask for special treatment" from the Fed. And he said, "I do not believe we were given special treatment" from the CFTC regarding the rule to limit firms' investments of customer funds.